Feral hogs, believed to have been released in Florida by Spanish explorers are prolific breeders and now pose serious problems for other flora and fauna over vast areas of public and private land in the Southeast. Besides trail damage, hogs affect ground nesting birds, tortoise habitat, compete for food with native species like turkey and deer, eat turtle and snake eggs, trample and wallow in sensitive wetlands, destabilize the soil, degrading water quality and disrupting drainage patterns. 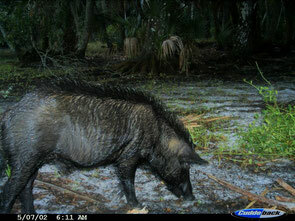 Learn more at My Florida Wildlife Commission and at IFAS. Public lands may use trapping to reduce their numbers especially in wilderness areas where use of dogs and vehicles might disrupt or destroy natural habitats for endangered plant and animal species.